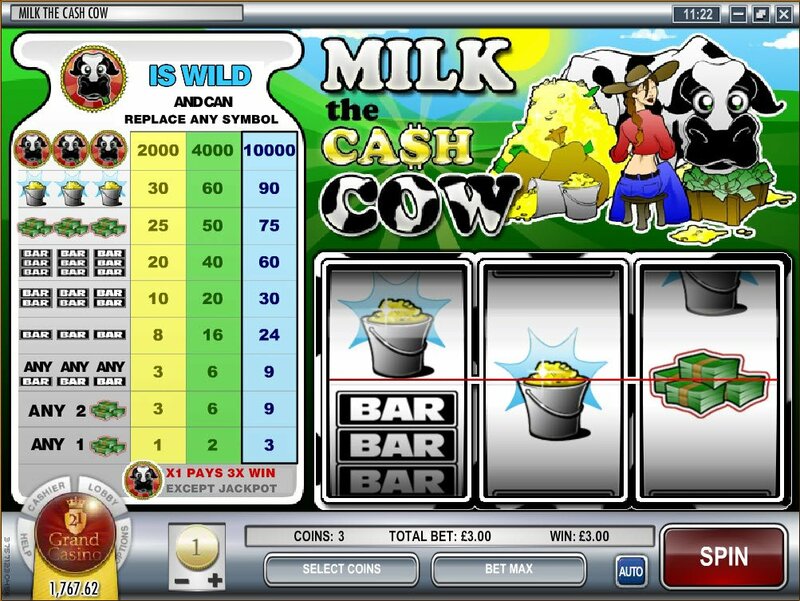 If you fancy having a go at Milk the Cash Cow slot, you could do worse that give it a squeeze. You’ll be delighted with the amount of gold coins a cow like Ethel can produce and you will most likely keep squeezing until her reels run dry. With a moo moo here, and a moo moo there, here a moo, there a moo: everywhere a moo moo. 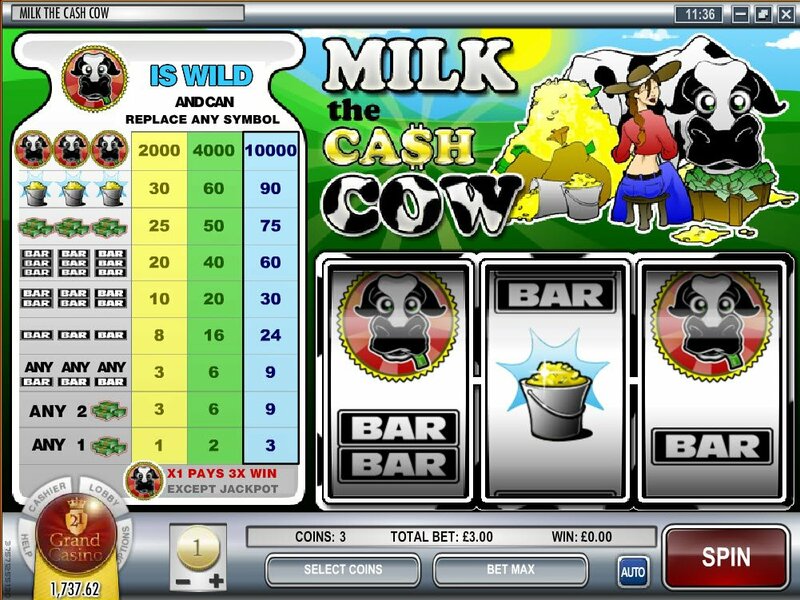 Milk the Cash Cow slot brings you the golden milk of the cash cow as you spin your reels to the sounds of distant mooing. Our big hatted farm girl is milking the money right from a very shocked looking lady cow up top, above our 3-reels and 1 payline. Perhaps the cow is named Ethel? She does look like an Ethel to me. Our farm girl looks like a Dorothy, not that I can see if she is wearing red slippers or not. Any one pile of lovely green cash will get you a few coins if spun into your payline and, two piles will get you triple the coins. Any bar symbol spinning its way into view will also give you a nice basis of some coins but, 3 bars will automatically give you up to24 coins, depending on your initial bet amount. Two bar symbols will give you up to 30 coins and, 3 bar symbols up to a round looking 60 coins. If you get 3 piles of cash in your payline, you can get quite a nice return on your money, up to 75 coins. Three buckets of gold that Dorothy milked from Ethel comes in at up to 90 coins. 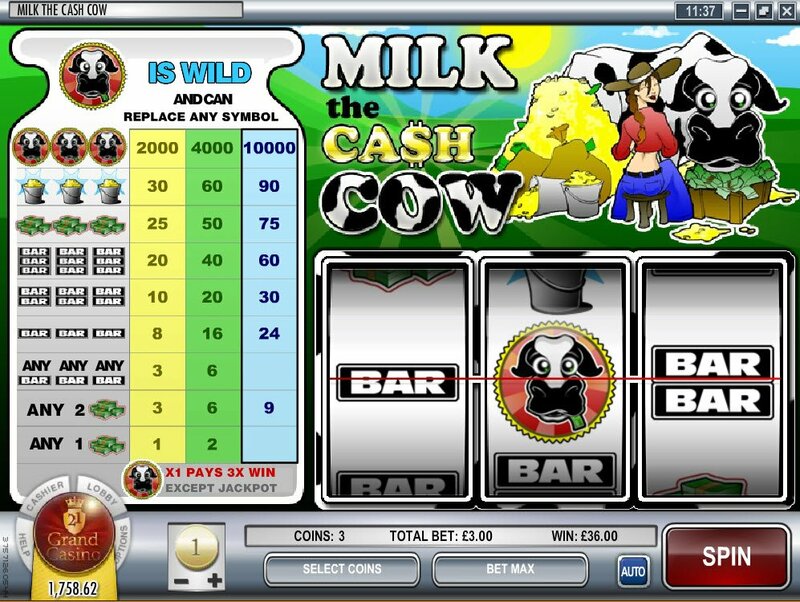 Milk the Cash Cow slot brings you the golden milk of the cash cow as you spin your reels to the sounds of distant mooing. When you spin one of our heralded cow wild symbols, a big, hefty moo will alert you to the fact you have definitely won some coins, and, if you spin three Milk the Cash Cow slot Wild Symbols, you will get up to a stunning 10,000 coins! It really is worth betting three coins on the off-chance you will strike it lucky and end up with such a large reward. If you play it safe with just one coin, you will still get 2,000 and 2 coins will get you 4,000 but, compared to the big prize on offer, you can really see the difference.